The Compass 27” Laminator is a perfect fit for schools and print shops. The heated silicon roller provides a clear, uniform lamination using up to 10 mil thick and allows for mounting and laminating materials up to 1/8” thick which is perfect for laminating posters, maps, book covers, signs, photographs, charts, and much more. The Compass is engineered to provide years of service with little or no maintenance. The microprocessor control prevents the laminator from operating until the optimum laminating temperature is reached which is 400⁰F. There is also an energy saving mode which automatically powers down the laminator to idle mode after 30 minutes of inactivity and automatically shuts down the laminator after an additional 30 of inactivity. The Compass Roll Laminator features internal tension rollers that provide perfect film tension control which produces clear, flat results every time. The easy load system makes loading and threading rolls of film safe and trouble free. The internal film supply monitor informs the user when the supply is low. The Compass’ heated silicone rubber laminating rollers are flexible and provide good edge seal and firm enough to offer a good surface seal. The rollers are spring loaded which ensures even and accurate pressure which is applied to documents for optimal results. The variable speed control lets you operate as fast as fifteen feet per minute; however, usually thicker laminating film produces the best results when set on a low to medium setting while thinner films work better on a medium to high setting. The Compass features a LCD temperature display that makes it easy to set and maintain the correct temperature throughout lamination. The Compass is easy to use and has conveniently placed controls and switches which provide a compact, reliable, easy, and safe machine. The Compass also has a more effective cooling system than any other machine in its class. Another great feature of the Compass Laminator is that it is easy to clean, however, the silicone rubber rollers of the laminator are easy to clean, and should be cleaned regularly. There is an attached polycarbonate safety shield which is clear so that the operators can see their work, and be protected. There is also a reverse function which will allow for easy removal of jams, and will help clear miss feeds. Jams can be a machine-breaking mistake, so this feature is very important, especially for those who will be taking advantage of its entire 27” width. The Compass Roll also comes with a two year manufacturer’s warranty to ensure maximum satisfaction! 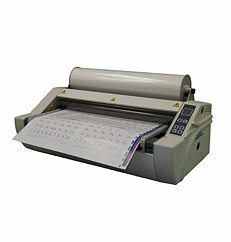 If you have any questions or are interested in the Compass 27″ Roll Laminator, visit us at SpiralBinding.com. We have great pricing on a full line of Variable Speed Laminators . Call us at 1-800-631-3572 for more information!